This Toshogu is the Toshogu referred to in the poem “和歌の浦には名所がござる、一に権現 (there are sights in Waka no Ura, firstly the shrine)”. Since long ago, it is known as Wakanoura Bay’s top sights for visiting and is still loved by everyone by the name of Gongen-sama. Originally enshrining the three figures of Tosho Daigongen, Hiesan’no Gongen, and Madarajin, Tosho Daigongen was the title of Bhaisajyaguru when it revealed as a god in Japan. It was known to heal illnesses and fulfill any wishes. Based on the myth that Tokugawa Ieyasu was the reincarnation of Bhaisajyaguru, Tosho Daigongen was renamed Toshogu in 1645 ordered by the royal family. Kishu Toshogu was established in 1621 by Tokugawa Yorinobu, the first feudal lord of the Kishu Tokugawa clan, as the protector of Nankaido. This took place about 400 years ago. At the time of its establishment, the lord took command himself and ordered those higher in social status (samurai and above) to carry stones etc. This followed the ancient example of Minamoto no Yoritomo when he established the Tsuruoka Hachimangu Shrine. The construction of the shrine hall is known as the gongen-zukuri or the ishi no ma-zukuri style and is one of the famous important cultural property of the Edo period with the resemblance of the Momoyama period. The luxuriousness decorated with the paintings of both Kano and Tosa schools, as well as lacquer and the delicate carvings rich in color liven up to the name of Nikko Toshogu of Kansai region. While it is rare to have numerous carvings done by Hidari Jingoro, the vibrant red color of the gate is also like no other in Kansai. The collection of 17 items of treasures including armor, pottery, paintings, as well as swords and clothing, registered as important cultural property are also famous. The harmony and serenity of the pine-covered mountains which create provide beautiful scenery on the seaside of Wakanoura Bay, and the vibrant colors of the shrine hall bring back the historical recollection to the people, embracing the nostalgia of the tradition and the sense of home of the soul. As a festival, this parade of portable shrines known as the Wakamatsuri is well known. Since the establishment of the Toshogu, this festival which has been passed on is a collection of traditional performances of Wakayama and has value as folklore. Held in May every year, the entire city of Wakayama is filled with the spirit of the festival. 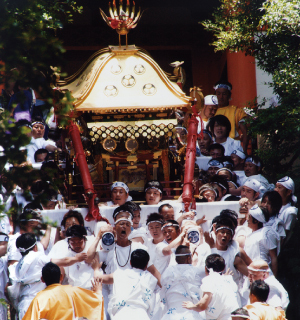 The Kishu Toshogu is noted in the poem “和歌の浦に名所がござる、一に権現様 (there are sights in Wakanoura, firstly the shrine)” and the parade seen during the festival held in May is known as the Wakamatsuri. At the beginning of the Edo period, Tokugawa Yorinobu, who was the tenth son of Tokugawa Ieyasu because the first lord of the clan in Wakayama. In addition to the policies he introduced for the development of the city of Wakayama, he has decided to set the beautiful land of Wakanoura to be holy ground and enshrine his father, Tokugawa Ieyasu who has passed away. Tenkai Daisojo, a high priest who was sent from Edo in 1621 became the guru and the ceremony of establishment of the Toshogu was held. This shrine is known to be the oldest shrine among the numerous Toshogu in Japan. The Wakmatsuri began in 1622, a year after the Toshogu was completed, to comfort the soul of the great father Tokugawa Ieyasu. This year is a special year that marks 390 years since the beginning of the parade. What Tokugawa Yorinobu, who started the festival, believed in was the participation of everyone who wished to, regardless of their social status while being a society with strict social hierarchy. The festival was organized in a way that the focus was on the specialties of the people and the parade, which practically, everyone was welcomed to join, was made up of over 3,000 people. It is recorded in Nanki Tokugawa-shi that since the time of the second lord, the number of performances in the parade was reduced in half due to issues with funding, etc. Although the form of the festival has changed since it started, we still have the skills passed down from parents to children, children to grandchildren, and those who have performed during the festival. 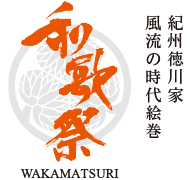 Wakamatsuri had faced decline at one stage, however, the Wakamatsuri Preservation Committee was established around 1990 and five years later, the establishment of the Young Men’s Group of Wakamatsuri Preservation followed. As one of the things that Wakayama takes pride in, this year, with the help of many participants over 1,000, we were able to hold a festival in a larger scale than recent years, celebrating its 390th anniversary. The large group of shishimai dancers from the Shinohachiman Shrine in Gobo City has joined our festival this year, which helped to boost the excitement. The festival was held on the day which Tokugawa Ieyasu had passed away, on May 17th, however as the number of freelance participants has declined, and because the number of participants has dropped on days other than holidays, the festival is now held on the holiday closest to May 17th. Photography contests have been held for more than ten years, and I wish for everyone to enjoy the festival to the fullest by looking at the festival from different angles, participating in the photography contest, visiting the area of Wakanoura and taking part in the parade on the day.